Sebago knows how to celebrate! In 1926, the town celebrated its 100th birthday – one hundred years since the signing of the petition to separate the town from Baldwin. It was an event that all residents got involved with, and it was designed to create pride and in the town and its accomplishments, as well as an opportunity for the community to get together and have fun! At a town meeting in the spring of 1926, voters approved a sum of $500 for the celebration, and appointed a committee of prominent citizens to organize the event, which took place on August 4th, in North Sebago. Though it was initially thought that $500 would be “more than enough” to fund a significant event, it turned out that some additional fund-raising was needed to ensure the success of the event. The needed funds were quickly and easily raised, along with a great deal of enthusiasm. A large tent was erected, a catering company provided a delicious meal, and Sebago “Centennial trays” were furnished for the event. The day’s celebration activities started with a parade of decorated automobiles and floats, led by Parade Marshall Edward S. Douglass, on horseback! The Maple Grove Grange won 1st prize in the Parade, with Dyke Mountain Farm and Potter Academy taking second and third prizes. Entertainment included a merry-go-round, the St. Cecelia Boys Band of Lewiston, demonstrations of boxing, wrestling and stunts by the boys from Camp O-At-Ka, a baseball game between rival camps, and seaplane rides, available all day. A mid-day dinner was followed by ice-cream and cold drinks, and then an afternoon program of speakers. The afternoon program included opening remarks by Fred W. Hill, followed by an opening prayer and audience singing of the song “Sebago”, by Lunetta M. Chessey. Featured speakers were Fred L. Meserve who talked about the history of Sebago, Dr. L.H. Poore, Philip R White, esq. and Hon. George H. Babb, who provided brief comments on Doctors, Lawyers and Teachers in Sebago. The program also included musical interludes by the St. Cecelia Boys Band, remarks from the perspective of non-resident summer visitors (Hon. Anson L. Brackett), and general addresses by Burton M. Clough and the Rev. E.J. Dennen. The formal program concluded with a poem by Lunetta M. Chessey and a closing benediction from Rev. Dennen. A baseball game between Steep Falls and Limington followed the speakers program. Limington won, 3-2! By this time in the day, it was estimated that 4,000 people were in attendance – certainly a big enough crowd to enjoy the evening fireworks display that lit up the sky over Sebago Lake to conclude the day’s festivities. 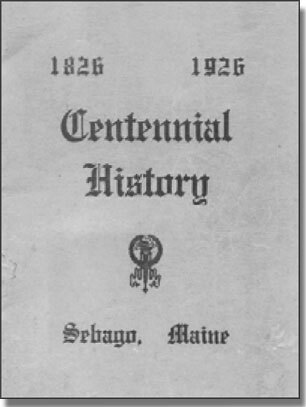 More information about this centennial celebration, as well as details of the speakers’ comments and additional historical information, can be found in a printed booklet held by the Sebago Historical Society and the Spaulding Memorial Library: “Centennial History of Sebago Maine: 1826-1926” , compiled by Fred L Meserve. The year 1976 marked two important events. It was the nation’s bicentennial – 200 years since the signing of the declaration of Independence in 1776. And it was also the 150th anniversary, or Sesquicentennial, of the founding of the town of Sebago in 1826. So there were two good reasons for celebration in Sebago that year! To mark the occasion of the 150th year since the incorporation of the town, the residents of Sebago showed great imagination and enthusiasm for the history of their town by creating a re-enactment of the very first “town meeting”, when a group of first settlers in the area gathered together on March 13, 1826, to start the process of seceding from Baldwin and incorporating the new township of Sebago. It was exactly 150 years later, on March 13, 1976, when Sebago citizens re-enacted that first town meeting. The 20th century descendants of the people who were involved in that early 19th century meeting were asked to participate in the 1976 re-enactment. There was an historically authentic stage setting, with appropriate costumes, and props. The meeting ended with the passing around of a jug of cider! Some of those involved in the re-enactment drama were; Philip White, who took on the role of Col. David Potter, the first moderator; Robert Brown, who read the original partition notice for Sebago’s secession from Baldwin; and Erland Wentzell, who was the narrator. The whole event gave new meaning to the idea of citizen participation in town meetings, and was enthusiastically received in the community and reported on in the local newspapers. Later in March, the Sebago Historical Society helped to continue the spirit of celebration by hosting an old-fashioned sing-along at the Town Hall (Potter Academy Gym). Other celebrations marking both the town’s Sesquicentennial and the nation’s Bicentennial were held through the spring and summer. These included a children’s mini-fair at the Elementary School, an Antique Show and Flea Market at the Town Hall (followed by a Bean Supper), a bicycle race and children’s bike/trike parade, a Hobby and Craft Show, a Children’s Pet Show, a Grand Parade and Firemen’s Field Day, Colonial Church Services, and a Fried Clam Dinner, sponsored by the Maple Grove Grange. The official town Seal, featuring a leaping landlocked Sebago salmon and designed by Mrs. Rose Barnes, was presented during one of these events. A printed booklet, the Town of Sebago Sesquicentennial Chronicle, 1826-1976, was also produced. It incorporates the earlier Centennial History of Sebago (compiled by Fred Meserve in 1926) and adds further information on the development of the town during the fifty years between 1926 and 1976, with a road-by-road description of houses, residents, and activities such as farming, logging, commerce, schools, churches and recreation. Even the weather gets special attention, with a very interesting eyewitness account written by Franklin Irish of a hurricane in Sebago in 1938. Noting that despite the fierce winds and rain and a great deal of downed timber, Mr. Irish reports that there was surprisingly little damage to buildings. He concludes: “I’ll say our old Sebago craftsmen built right”. In ten year’s time, Sebago will celebrate its 200th birthday! There is still plenty of time for planning, but it’s not too early to start thinking about what and how the town might celebrate! The Historical Society will partner with the town officials to make things happen, but the residents of Sebago are the central figures here! It’s your/our collective birthday! We’ll be 200 years old! What shall we do to make this a very special celebration? The Historical Society wants to hear from you! Pease let us know your ideas for celebrating Sebago’s Bicentennial in 2026. Email us at twohundred@sebagohistoricalsociety.org.